Image caption 95 per cent of Venezuela's export income comes from oil. Venezuelan President Nicolás Maduro has named a general to head the state oil company, PDVSA, and the country's energy ministry. Mr Maduro said the appointment of Major General Manuel Quevedo was "a new oil revolution" to tackle corruption. Last week executives of Citgo, the oil company's US refining subsidiary, were arrested over corruption allegations. Venezuela is in a deep economic crisis the government blames on "enemies in the US". Opponents cite mismanagement. The move comes days after PDVSA and Venezuela were declared in selective default for failing to meet payments on bonds. The company's bonds represent 30% of Venezuela's external debt. Analysts say the Venezuelan oil industry has been damaged by underinvestment, chronic corruption, the departure of many of its most experienced people with expertise and training, and a shortage of spare parts. PDVSA accounts for about 95% of the country's export earnings but output has been in steep decline for years. President Maduro said on Sunday that increased productivity was a top priority. It is unclear how Gen Quevedo will increase oil production and what role he will have in restructuring Venezuela's debt, but Mr Maduro has urged him to purge PDVSA of corruption. Correspondents say that as oil production flags, Mr Maduro's administration appears to be switching blame for the country's spiralling economic crisis from the opposition to officials in the oil industry. 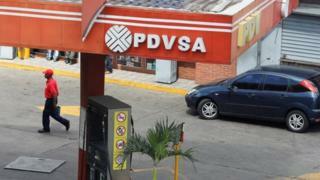 About 50 managers at PDVSA have been arrested since August. Gen Quevedo is an officer in the National Guard, which played a key role in subduing violent anti-Maduro protests in 2014. At least a third of President Maduro's cabinet is made up of active or retired officers, and the military has become a major pillar of his support. Gen Quevedo was formerly a minister of housing, and has no known significant experience in the energy sector.